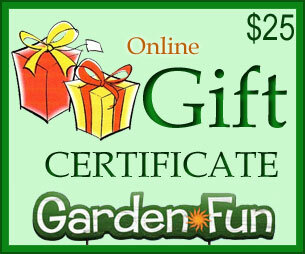 It's never too late with a thoughtful GardenFun Online Gift Certificate! Your gift certificate will be emailed to your recipient immediately after purchase. When you order this Gift Certificate, your recipient will receive a personalized email from you that will include our website, and a Unique Gift Certificate code that can be used for ANY items in our store! There are no fees or shipping charges associated with our gift certificates, so for example, a $50 Gift Certificate will truly be good for a $50 Credit, and not a penny less! They will love it, we promise!